Happy Valentine’s Day everyone! Let’s see what’s on! ABC has an all new episode of AMERICA’S FUNNIEST VIDEOS. The 16th season premiere of THE AMAZING RACE is on CBS. 11 teams start in LA and try to make their way to Chile for the first pit stop! NBC is airing more of the Olympics all night long – highlights include the Pairs Figure Skating short program, live men’s aerials in freestyle skiing, the men’s final in luge, and possibly, some alpine skiing we’re not delayed due to the weather. FOX has all new episodes of THE SIMPSONS and THE CLEVELAND SHOW. 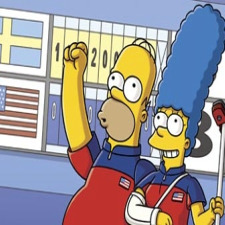 On THE SIMPSONS, Homer and Marge discover the crazy world of curling. On CLEVELAND, Cleveland plans to set Holt up with a new lady (voiced by Fergie). ABC has an all new episode of EXTREME MAKEOVER: HOME EDITION – Ty and the team help a family with under privileged children. Tyler Perry stops by to help out. CBS has an all new episode of UNDERCOVER BOSS. The president of Hooters goes undercover to see what it’s like in his restaurants. The Olympics continue on NBC – Moguls skier Patrick Deneen has a great chance of getting a medal. FOX has all new episodes of FAMILY GUY and AMERICAN DAD. On FAMILY GUY, when Chris and Stewie get lost in the woods, Lois contacts a psychic to find them. On AMERICAN DAD, a cyborg version of Stan, sent from the future, intrigues current Stan more than trying to get romantic with Francine for V-Day. HBO has another all new episode of BIG LOVE. Bill tries to get Jerry and Tommy to give the casino more exposure! Ben and Jodean get involved in Lois’ bird scheme, and Margene worries that Bill’s business will negatively impact her new business. ABC has hour two of EXTREME MAKEOVER: HOME EDITION. CBS has an all new episode of COLD CASE. They investigate the 1983 death of a graffiti artist. More information is revealed about who mugged Valens’ mom and Lilly continues to face legal hurdles. NBC has more of the Olympics.